I can’t believe today will be our last day in Vietnam! We are both pretty sad about leaving and were craving some good Pho before we left. 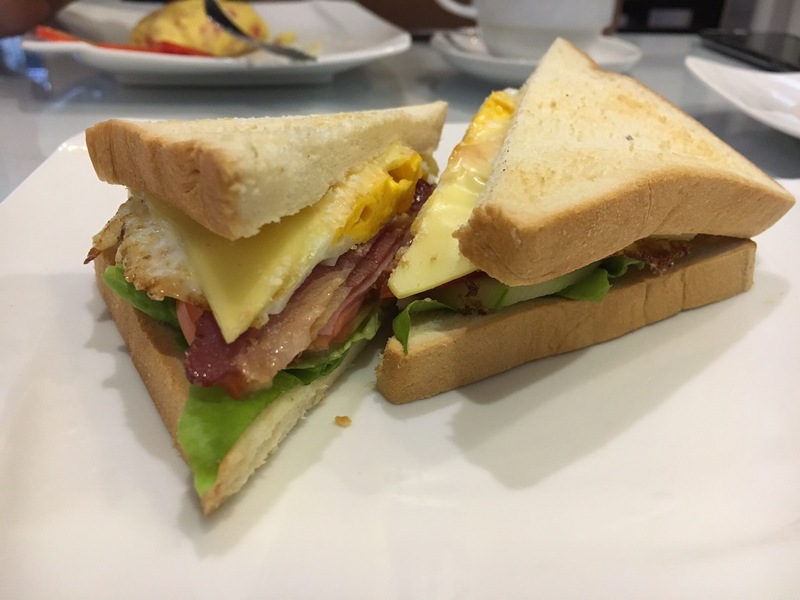 Unfortunately, our hotel ran out of Pho for breakfast so I just stuck to a breakfast sandwich instead. 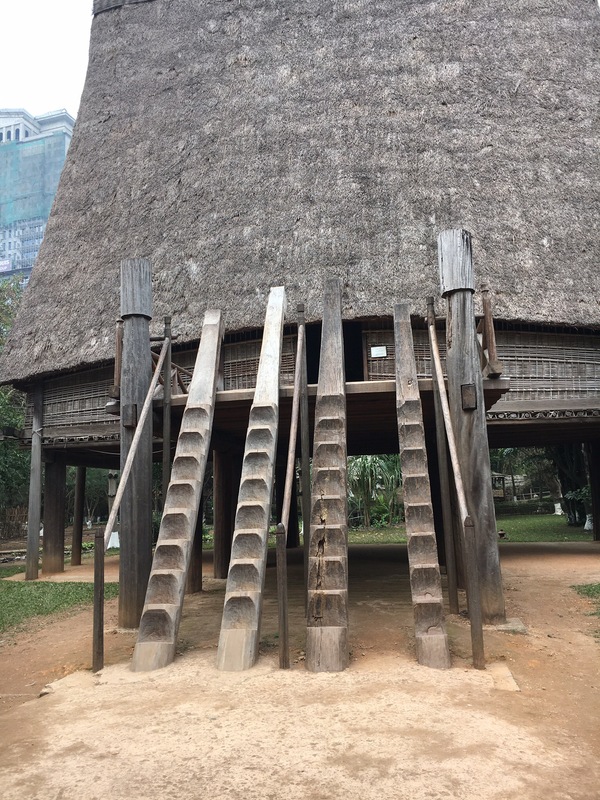 Our tourist attraction for the day was the Vietnam Museum of Ethnology. It was supposed to be the highest ranked museum in Hanoi per TripAdvisor, so it made my short list. 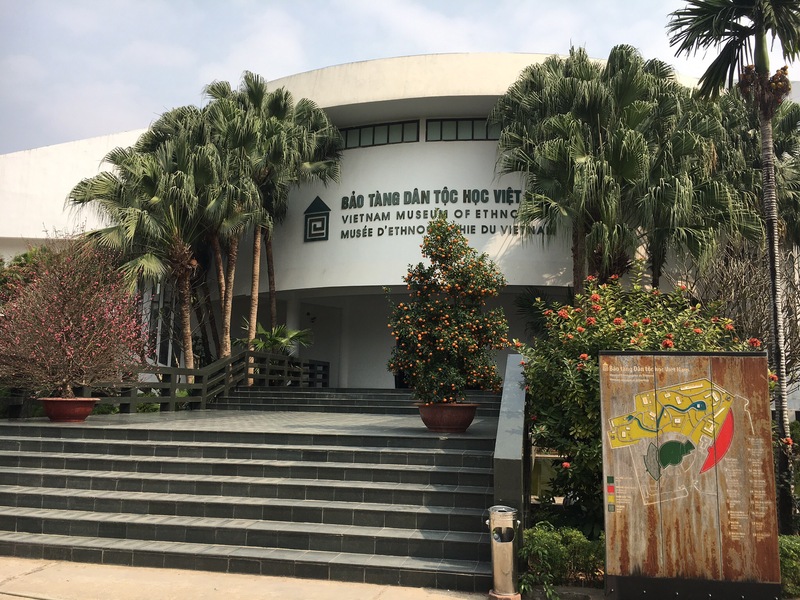 I looked into the Ho Chi Minh Mausoleum and the Hoa Lo Prison as well but I don’t I can handle seeing the embalmed body of Mr. Ho Chi Minh or another graphic presentation of the POWs during the American war again (flashback: HCMC War Museum). The Museum of Ethnology is a museum showcasing the 50+ different ethnicities in Vietnam. The most interesting part of the museum is the “open-air” exhibit of the different types of houses built by these different ethnicities. It was pretty neat to see videos on how these houses were constructed by hand. It is located around 8km from the city centre so we needed to Uber there. We did a lot of walking and climbing into the stilt-houses (up “stairs” which probably does not meet North American safety standards) and worked up quite the appetite. Aaron wanted to check out a cool co-working space the other side of West Lake, so we were off on another Uber trip. Unfortunately, they were closed for the holidays. Luckily, there was another nice cafe/bakery nearby called Joma Bakery Cafe which had quite a nice ambience to do some work (lots of light, nice soft music), so in we went. We both didn’t really feel like salads or sandwiches so we decided it was a cake and coffee for lunch kind of day. I had my favourite carrot cake and Aaron had the banana cake. Both were not bad! Aaron had his Americano and I had one last Iced Coffee with condensed milk in Vietnam. 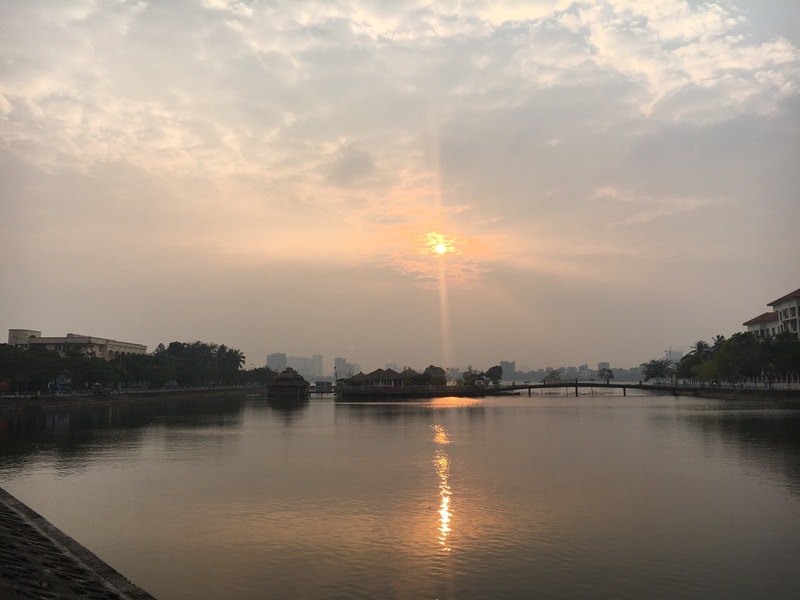 It was almost sunset, so we took a walk along the West Lake. It was a very nice area with many modern service apartments and it was great for people watching. There were people at street stalls drinking beer and eating snacks, people walking their dogs, fishing, dating, meditating and exercising. We even came across a temple (Phu Tay Ho) with rows of incense vendors and fortune-tellers outside of it. There is a Chinese saying that “If you enter someone’s house, you must acknowledge them. If you enter a temple, you must pray to the gods.” So that is what I did. I made my rounds to pay my respects and made a small donation and then we were on our way again. It seems that it will take our Uber a while to get to us, so we decided to make use of the exercise equipment at the park. Some did not work the muscles too much, and were good for elderly to just move their joints, while others used your own body weight and did provided some resistance training. It appears our Uber driver has given up and turned around. That is always a bad sign and makes me feel that I am stranded since I am somewhere that Ubers do not drive to. We tried walking out to the main road to see if that would help. It was not the most pleasant walk as I was speed walking trying to avoid the bats flying around the side of the lake. I was taught that bat bites equal rabies until proven otherwise and I had elected not to get my rabies shot! We eventually made it to the main road and summoned a Uber, which actually did come after 15 minutes or so. It was nice to finally go home, to a familiar place, without bats. We dropped off our stuff and then headed out, in hopes of getting some good Pho during our last night here in Hanoi. We walked to Pho 10, which was always full of patrons sitting on little stools outside. Not tonight. We were confronted with the closed gate sign again. Defeated, we continued walking down the block and reached another noodle place which seems busy. We sat down and ordered 1 Bun Cha for Aaron and 1 Pho Bo Ga for me. The pork was quite tasty from the Bun Cha but the quantity was small compared to at Bun Cha Huong Lien. My Pho was pretty good, but was missing the extra chillies on the side, like when we were in HCMC. Sanitation is also not a priority here as the server just handed us the leftover veggies from the patron next to us we left. We decided to pass on raw veggies tonight. We then walked for the last time to the Hoan Kiem Lake in hopes of catching the Water Puppet Show at the Thang Long Water Puppet theatre. We heard mixed reviews of it, saying it is a tourist trap and that there were no translations and people not knowing what was going on. But we thought it was a cultural experience worth a visit. I actually quite enjoyed it, more so than any museums I’ve visited here. It was a good 50 minutes of traditional live music, good use of pyrotechnics, amazing puppetry techniques and comedic story lines mixed with mythical creatures. Not a bad way to spend 100,000 VDN (~$6 CAD). We thought we would end our night watching over the lake at i-Feel Cafe and Lounge, whose entrance was hidden in some clothing store. It was nice to enjoy one more avocado smoothie. I was pleasantly surprised that they added coconut milk to it! It still could not compare to Five Boys though. So that was how we spent our last day in Vietnam! Next up: Thailand!